Normally, when you think contact paper, you think the gross and disgusting stuff the previous owners a had lining the shelves. I know when we moved in to our first house, there was this awful 1980s era contact paper stuck to the cabinets. When we pulled it off it left a sticky residue. For me, contact paper was akin to wallpaper. Ugly. And needing to GO. YESTERDAY. I'm really not sure which project is my favorite. I love that people are using contact paper instead of vinyl in their cutting machines. I don't have one (yet) but contact paper is a much more affordable option. 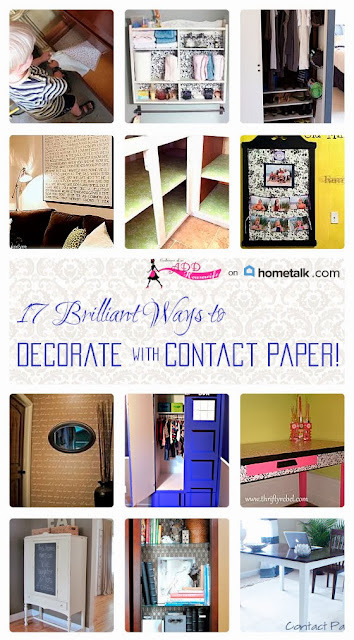 Head on over to Hometalk and be inspired! I love these projects! I have a bit of a contact paper problem at the moment, was wondering if you might be able to help out. I saw a project somewhere, can't remember where, that put leftover contact paper on the bottom of a kitchen cabinet. I think it was called the "toe kick?" Anyway, question is I have some leftover chalkboard contact paper from another project. What do you think about using that on the toe kick?